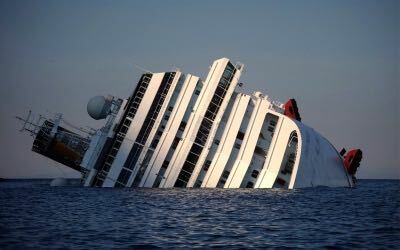 This morning Titan Salvage and their italian partners began to right Costa Concordia with the event being streamed live. After an act of epic navigational stupidity by her master Costa Concordia ended up on a rocky shore partially submerged with a port list of around 70˚. Here she is in January 2012 not long after the incident. 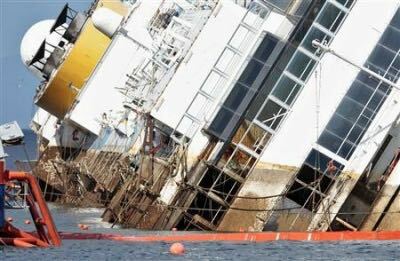 Titan won a competitive tender with their ambitious plan to right the ship, re-float her and tow her away to be scrapped. Details are here. Here she is this afternoon. Her funnel was been cut off during preparations and the previously submerged heavily fouled area is clearly visible. By sunset she had been moved about 15˚ towards the vertical and all was going well. Outstanding work. They expect her to be upright by dawn tomorrow.